It goes without saying that engagement marketing is the key to building customer loyalty. One of the biggest ways brands can combine both technology and engagement is by creating a strong digital brand experience. We know that soon every brand will need to incorporate digital activations, after all, it is the future of marketing. There is huge growth in Vive, Oculus Rift and other Virtual Reality plays, motion graphics, projection mapping and multi-touch experiences to engage consumers. Below are the top 3 things to keep in mind as your company plans your brand engagements. 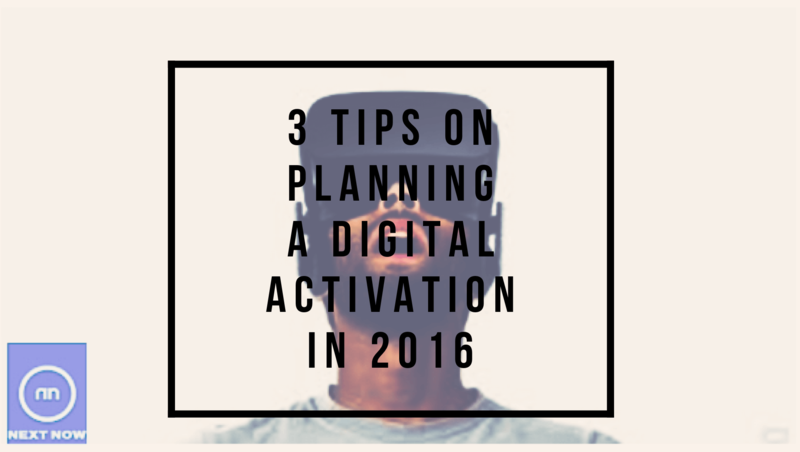 Digital activations are not optional. It is not an option to incorporate a digital experience — just know that your competition already is. The great thing is that no matter how big or small your marketing budget may be, digital activations are scalable and can be included. Be disruptive. When planning a digital activation remember the sky’s the limit. One of the key things we tell our clients here at NEXT/NOW is to be disruptive. We want to surprise people and show them something they have never seen. The reality is, anything we imagine is possible, so let’s do it! Include social media. Every marketing strategy must be completely integrated and this includes social media and sharing capabilities. Social sharing is free marketing and the best way to keep the conversation going long after the activation. Let’s get started! Reach out to us at [email protected] with questions, or visit our website at nextnowagency.com.